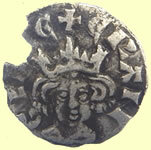 While best known for his campaigns to subdue Wales and Scotland, Edward I's work with English common law earned him the name of the 'English Justinian'. 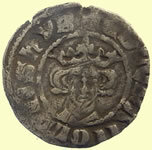 The eldest son of King Henry III, as a young man he was defeated in Wales by Llywelyn ap Gruffudd, Prince of Gwynedd (now in North Wales). 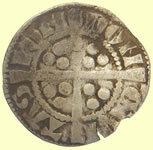 During the civil war between his father and the barons, he was held captive by Simon de Montfort, the rebel leader, before escaping to take control of the royalist forces, whereupon he defeated and killed Montfort. 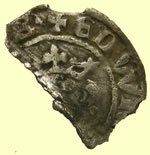 Edward learned of his father's death in November 1272, while returning from a crusade. 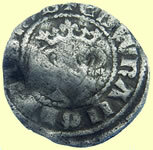 Once king, he returned to complete his unfinished business in Wales. 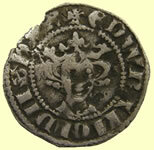 He invaded in 1277, defeated Gruffudd and built a ring of castles around Gwynedd to enforce his authority. 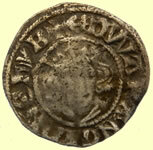 When his rule provoked rebellion, he invaded again. 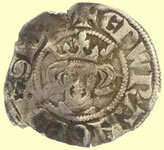 After killing Gruffudd, he reorganised Wales along English lines; the principality would remain calm for over a century. In Scotland, however, Edward was less successful. 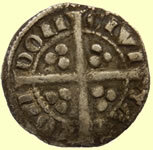 Although he was paid homage and put John de Balliol on the throne in 1292, his authoritarian approach eventually provoked the Scottish nobles to force Balliol to ally with France in 1295. Edward invaded and conquered Scotland the next year, but faced revolts led by William Wallace until 1303. 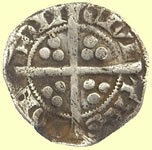 At home, Edward was responsible for making Parliaments an integral part of English politics. 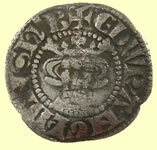 He understood their value in strengthening royal authority and used them to promote a variety of legal and administrative reforms. 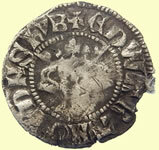 The Statute of Mortmain (1279) gave the crown control of any church land acquisitions and the Statute of Winchester (1285) codified and strengthened the system for preserving public order. 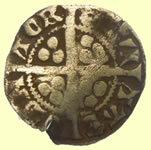 However, the strain and cost of war brought conflict between Edward and his barons. 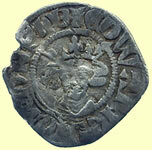 They forced through laws forbidding arbitrary taxation, forcing Edward to abandon the campaign and eventually to make peace with France. 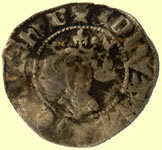 Edward renewed the conquest of Scotland in 1303, captured Stirling in 1304, and executed Wallace as a traitor in 1305. 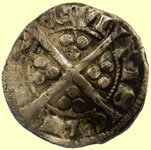 But just when Scotland seemed sorted, Robert I ('the Bruce') rebelled again and was crowned in 1306. 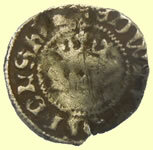 On his way to reconquer Scotland, Edward died near Carlisle. 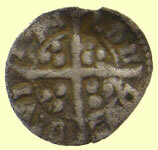 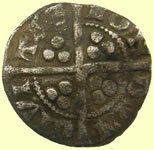 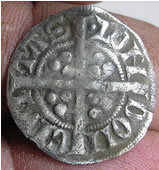 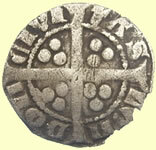 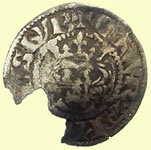 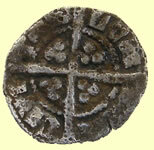 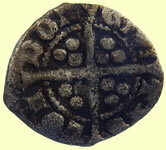 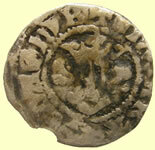 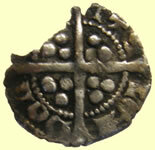 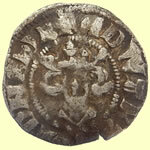 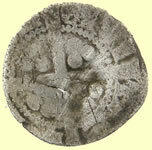 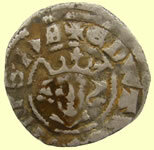 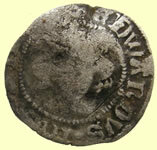 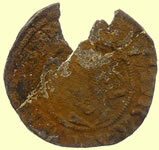 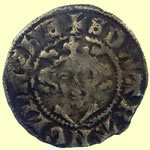 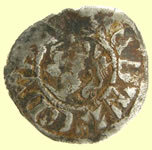 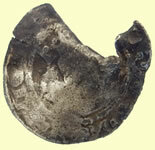 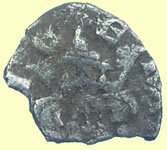 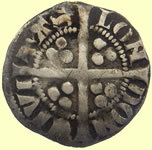 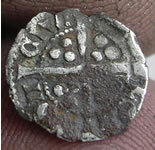 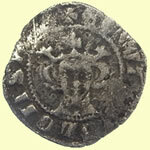 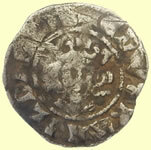 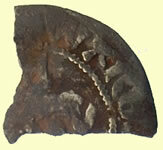 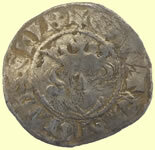 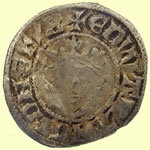 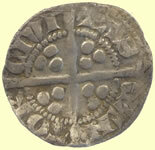 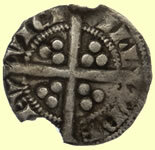 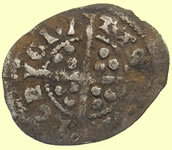 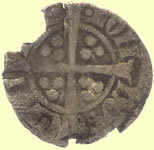 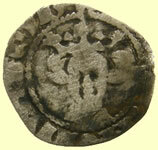 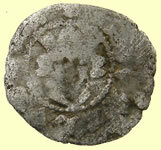 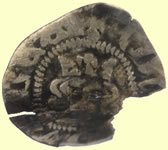 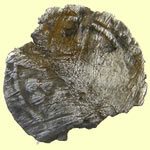 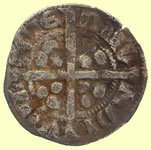 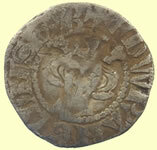 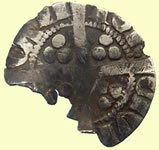 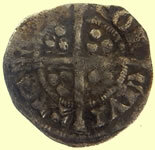 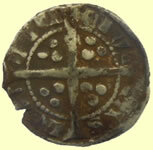 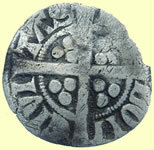 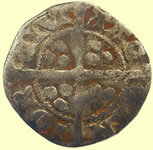 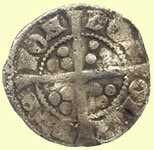 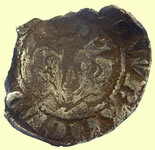 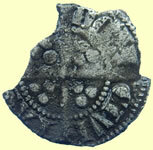 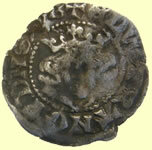 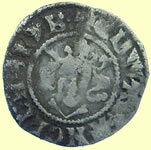 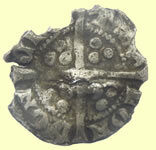 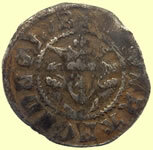 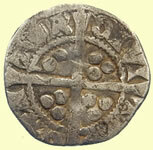 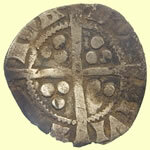 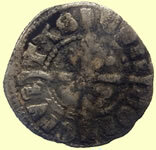 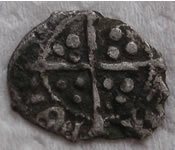 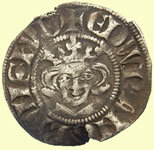 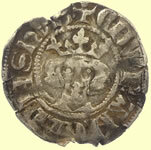 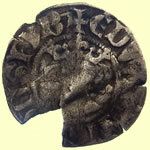 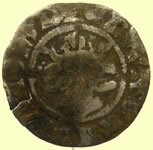 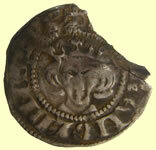 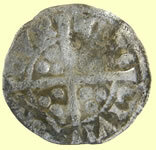 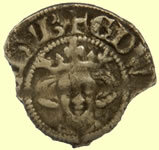 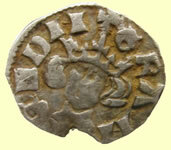 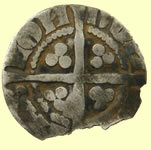 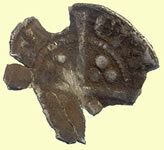 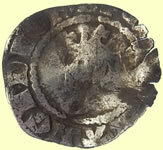 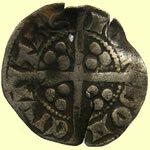 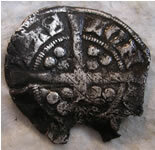 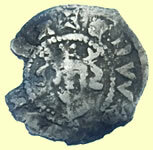 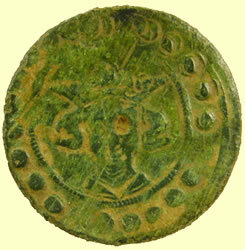 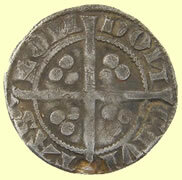 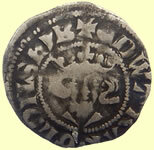 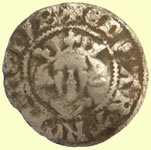 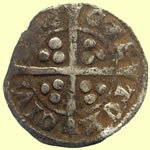 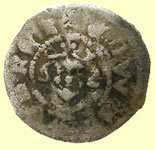 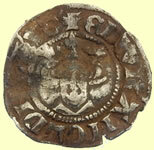 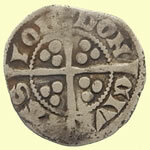 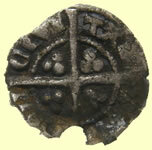 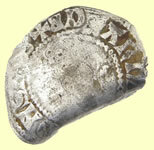 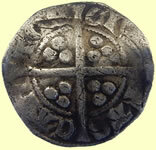 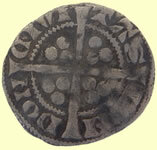 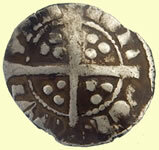 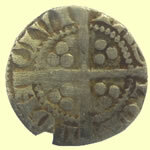 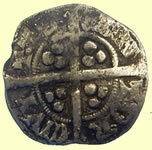 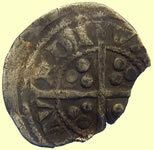 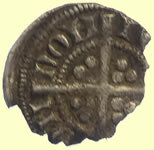 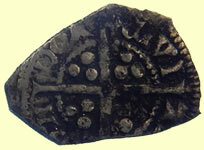 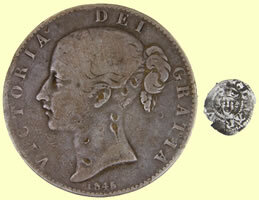 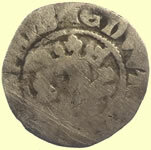 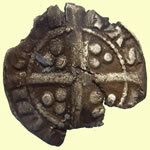 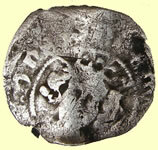 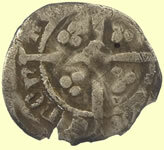 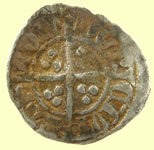 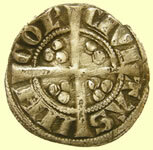 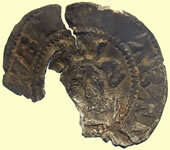 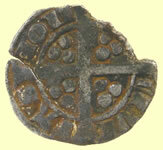 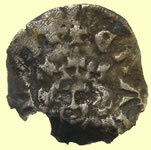 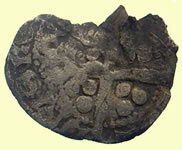 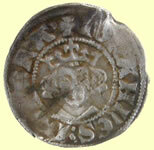 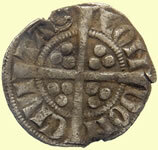 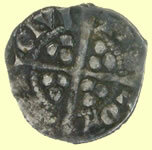 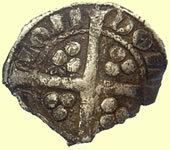 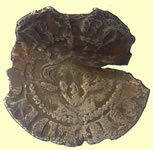 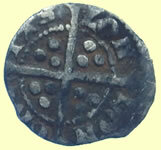 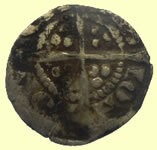 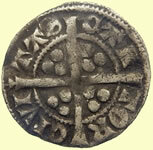 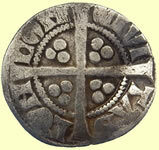 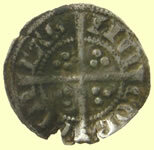 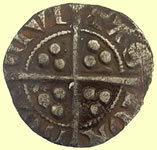 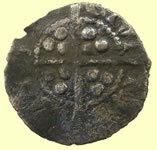 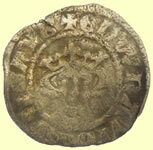 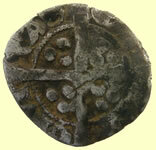 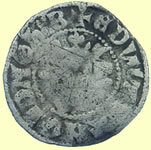 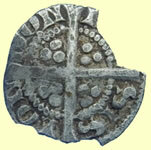 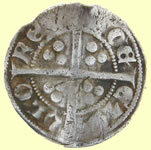 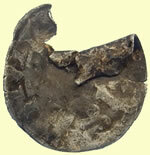 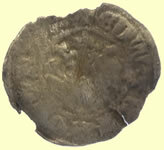 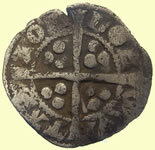 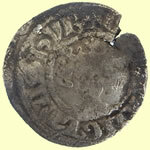 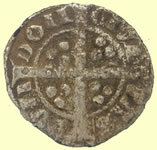 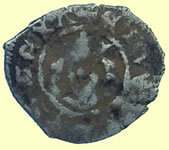 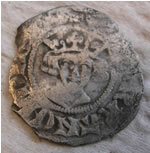 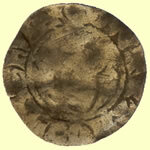 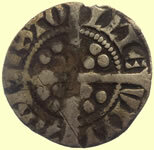 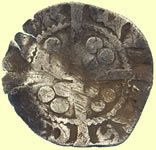 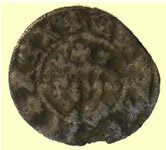 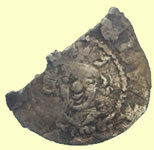 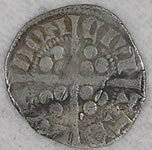 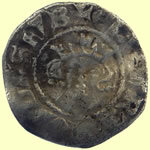 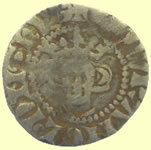 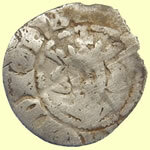 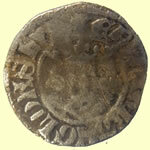 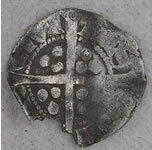 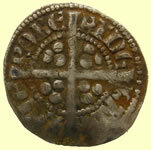 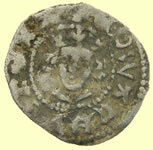 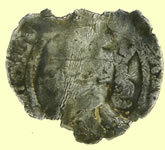 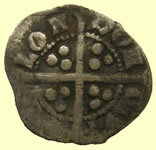 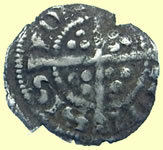 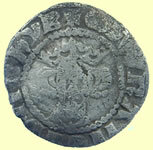 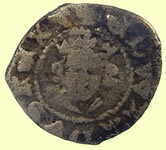 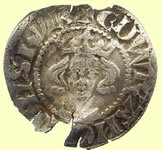 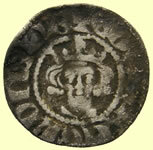 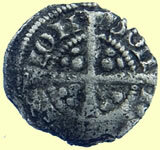 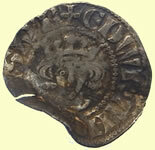 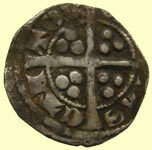 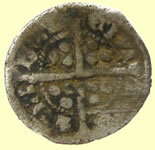 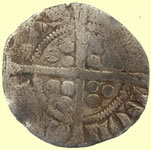 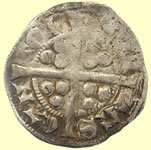 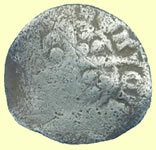 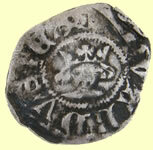 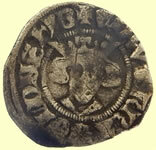 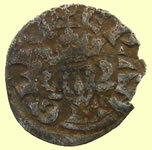 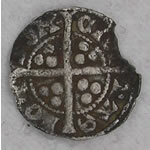 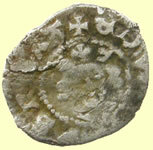 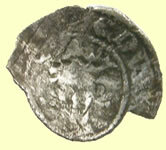 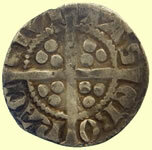 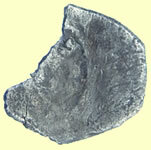 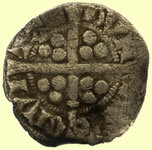 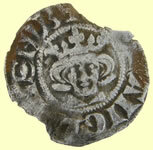 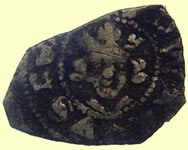 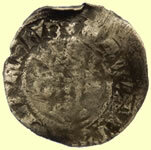 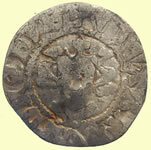 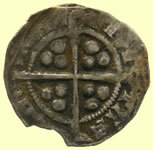 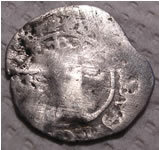 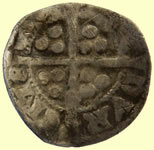 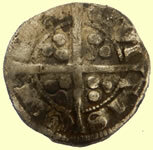 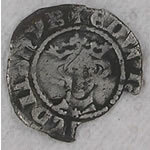 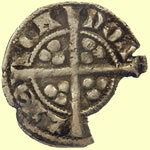 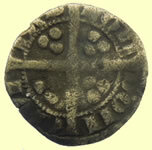 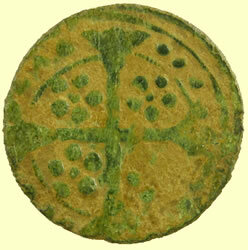 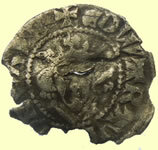 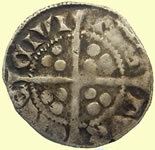 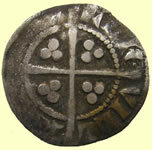 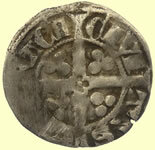 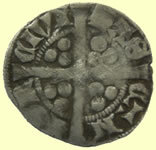 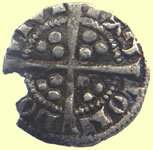 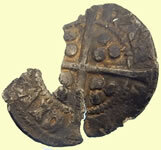 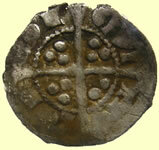 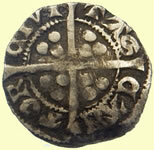 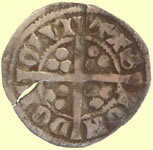 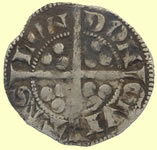 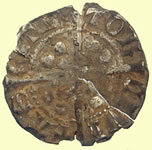 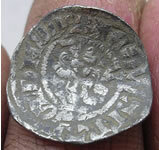 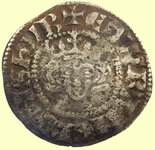 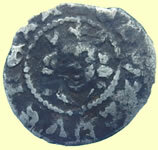 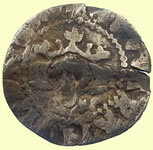 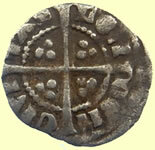 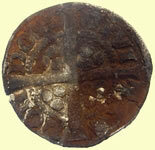 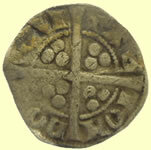 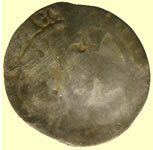 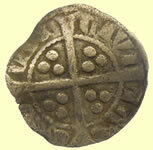 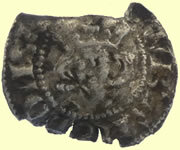 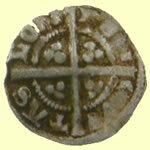 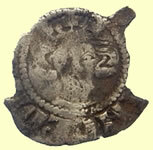 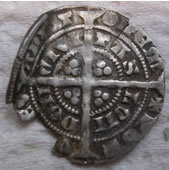 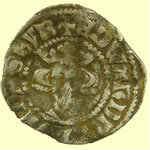 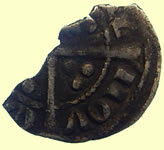 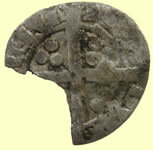 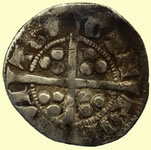 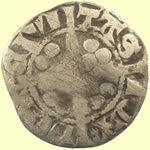 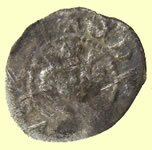 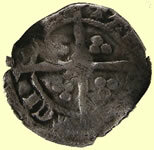 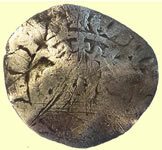 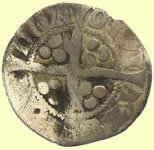 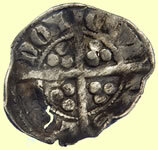 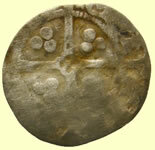 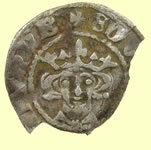 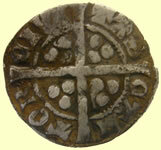 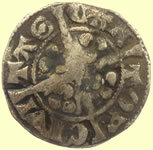 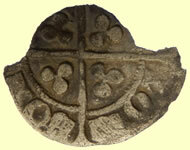 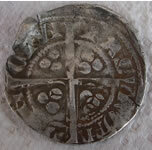 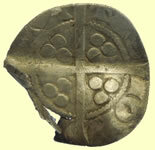 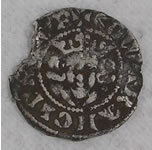 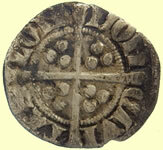 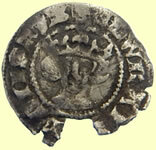 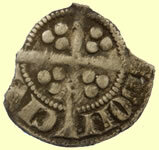 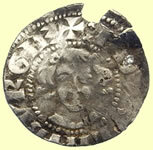 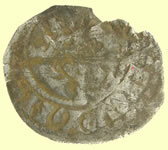 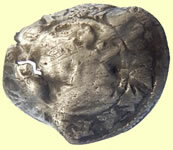 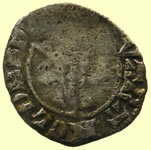 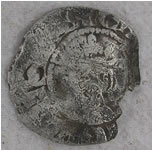 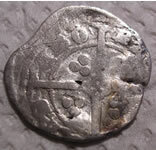 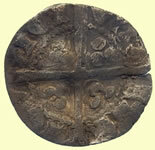 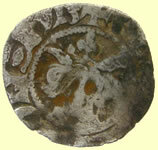 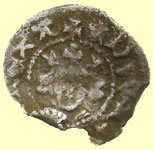 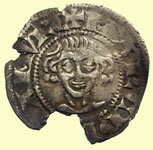 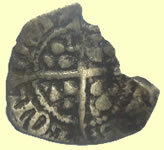 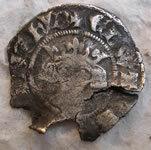 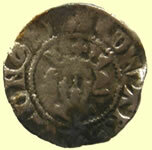 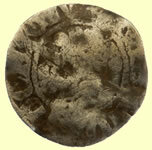 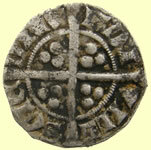 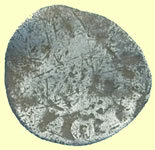 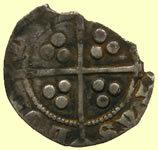 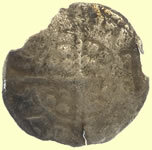 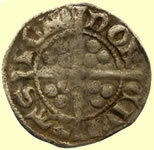 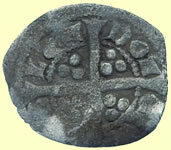 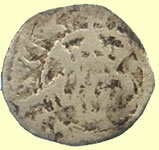 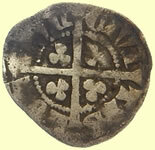 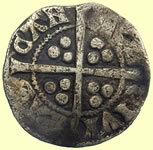 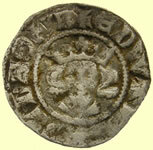 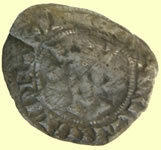 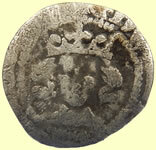 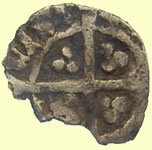 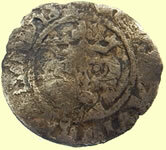 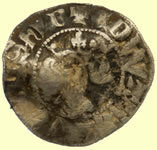 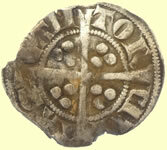 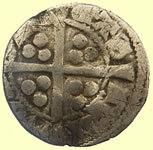 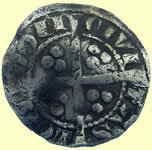 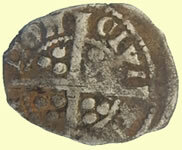 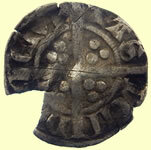 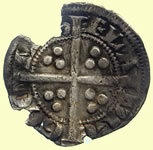 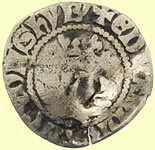 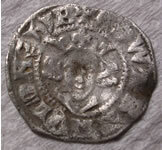 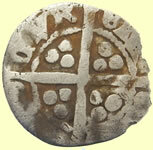 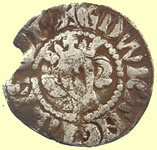 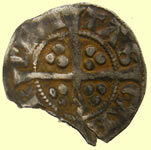 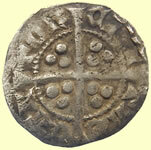 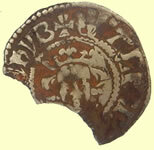 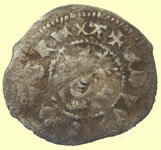 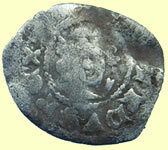 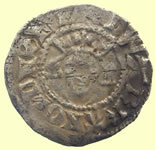 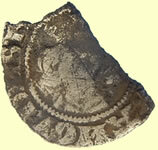 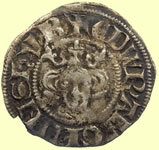 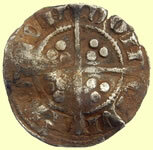 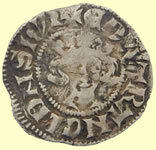 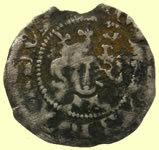 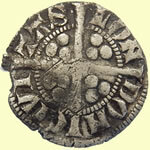 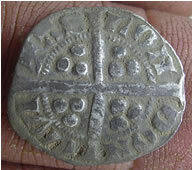 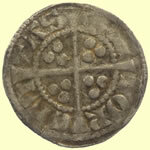 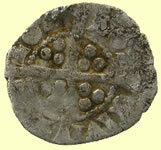 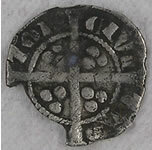 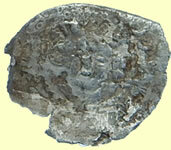 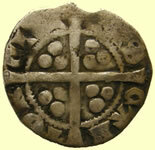 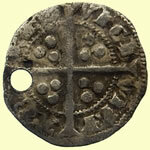 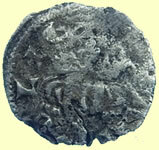 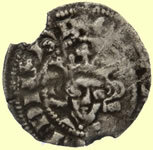 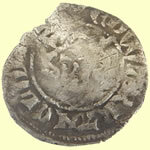 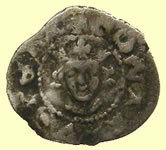 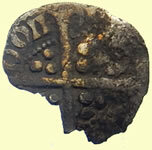 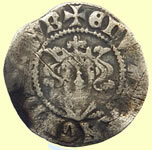 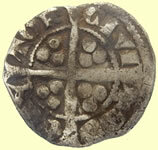 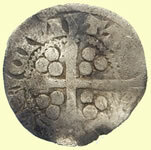 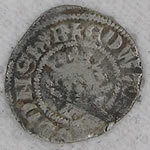 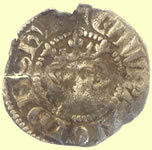 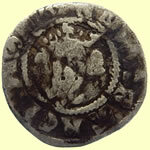 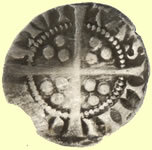 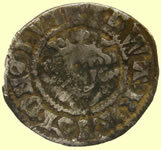 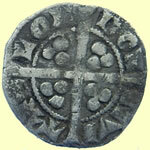 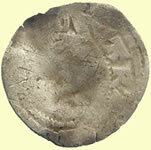 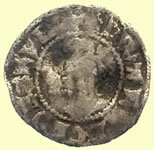 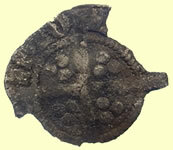 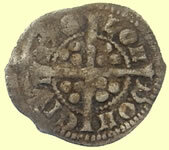 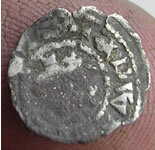 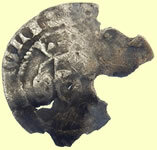 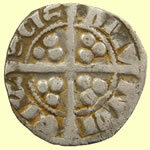 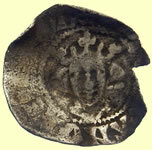 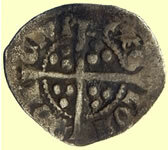 From the end of the 12th century, the English penny, known for it's good silver, became a standard in north-west Europe. 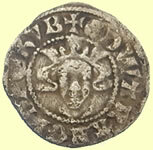 Merchants in the Low Countries (especially Flanders, Brabant, Hainaut) went to England to buy the high quality wool and paid with English pennies. 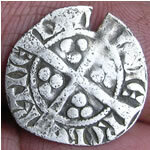 To get them they exchanged silver bars and/or light weighted coins in English coin work shops. 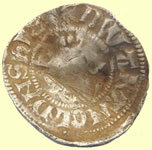 To avoid exchange rates and increase profits, they soon started minting their own copies. 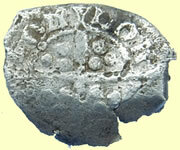 In the same alloy and weight but also in baser material to earn more money. 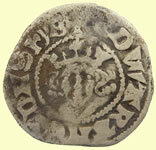 As the majority of the medieval population could not read, it was no problem if the legends were not correct or with the name of the local count and mint. 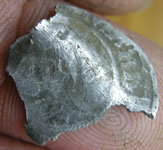 If it looks correct, it must be correct! 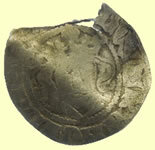 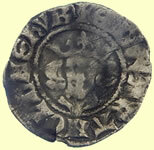 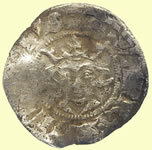 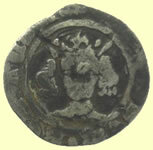 Silver contemporary counterfeit of a sterling of Gaucher De Chatillon (1303-29), Count of Porcien. 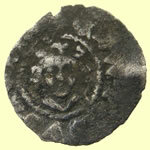 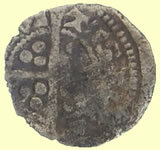 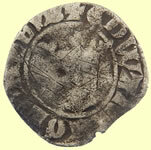 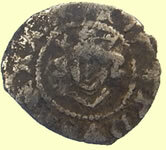 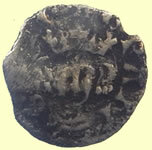 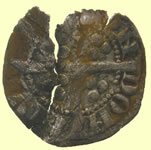 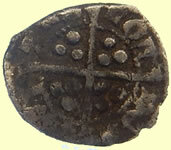 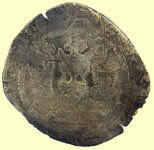 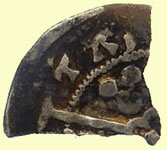 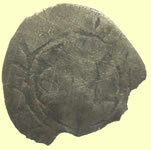 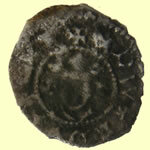 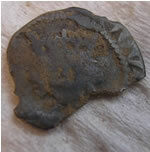 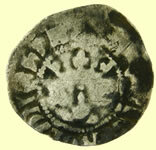 Facinating half penny double struck with long cross both sides. 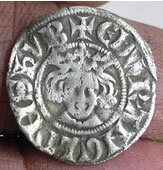 Obv ***o R'o DNS o hYB ??? 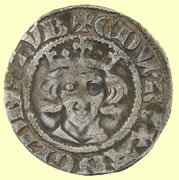 Edward was a king of England whose reign was marked by conflict with the nobles until he was eventually overthrown by his wife in favour of his son. 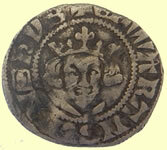 Edward was born on 25 April 1284, the fourth son of Edward I of England. 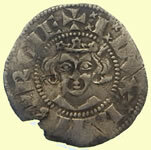 He was the first English prince to hold the title prince of Wales, which was bestowed on him by his father in 1301. 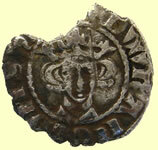 Edward I died in July 1307 and, his three elder brothers having pre-deceased him, Edward became king. 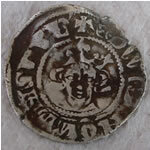 He immediately recalled his favourite, Piers Gaveston from exile - Edward I had banished him to France for his bad influence on his son. 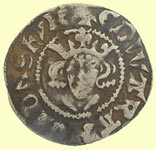 Gaveston was given the earldom of Cornwall, previously a title conferred on royalty. 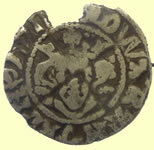 Opposition to the king and his favourite began almost immediately, and in 1311 the nobles issued the 'Ordinances', which attempted to limit royal control of finance and appointments. 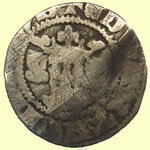 Gaveston was twice exiled at the demand of the barons, only to return to England shortly afterwards. 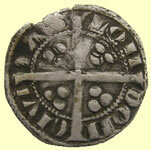 In 1312, he was captured and executed by the barons. 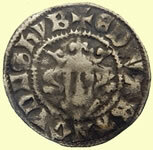 In 1314, Edward invaded Scotland, only to be decisively defeated by Robert the Bruce at Bannockburn. 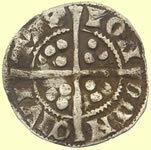 Power was now in the hands of the barons headed by Edward's cousin Thomas of Lancaster, who by 1315 had made himself the real ruler of England. 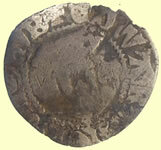 Yet Lancaster did little to initiate reform and parts of the country collapsed into anarchy. 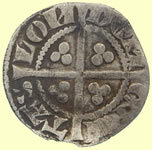 By 1318, Edward and Lancaster had been partly reconciled, but the king had two new favourites, Hugh le Despenser and his son. 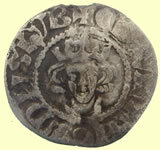 When Edward supported the two Despensers' ambitions in Wales, a group of barons banished both father and son, prompting Edward to fight back. 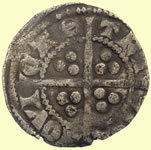 He defeated Lancaster - who had appealed to the Scots for help - at Boroughbridge in March 1322, executing him and recalling the Despensers, with whom he now ruled. 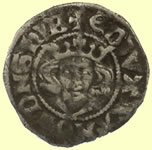 Edward's wife, Isabella of France, now emerged as a focus of opposition. 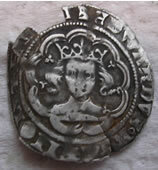 In 1325, she was sent on a diplomatic mission to France where she met and became the mistress of Roger Mortimer, an exiled opponent of Edward. 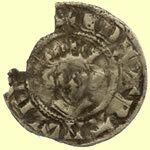 In September 1326, they invaded England. 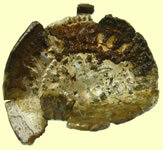 There was virtually no resistance and the Despensers were captured and executed. 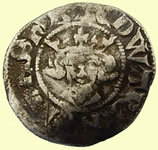 Edward was deposed in favour of his and Isabella's son, who was crowned Edward III in January 1327. 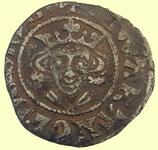 Edward II had few of the qualities that made a successful medieval king. 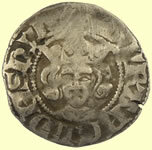 Edward surrounded himself with favourites (the best known being a Gascon, Piers Gaveston), and the barons, feeling excluded from power, rebelled. 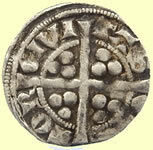 Throughout his reign, different baronial groups struggled to gain power and control the King. 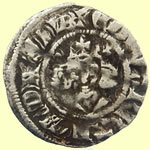 The nobles' ordinances of 1311, which attempted to limit royal control of finance and appointments, were counteracted by Edward. 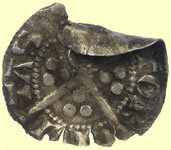 Large debts (many inherited) and the Scots' victory at Bannockburn by Robert the Bruce in 1314 made Edward more unpopular. 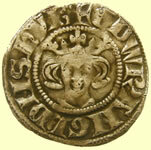 Edward's victory in a civil war (1321-2) and such measures as the 1326 ordinance (a protectionist measure which set up compulsory markets or staples in 14 English, Welsh and Irish towns for the wool trade) did not lead to any compromise between the King and the nobles. 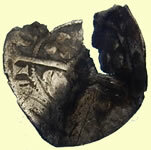 Finally, in 1326, Edward's wife, Isabella of France, led an invasion against her husband. 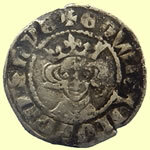 In 1327 Edward was made to renounce the throne in favour of his son Edward (the first time that an anointed king of England had been dethroned since Ethelred in 1013). 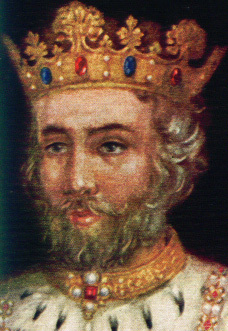 Edward II was later murdered at Berkeley Castle.